Chef Charlie McKenna created Lillie�s Q restaurant in July 2010 in Chicago, named for his Grandmother Lillie, who taught him the art of southern cooking back home in Greenville, SC. As Charlie traveled the BBQ competition circuit from Memphis to Alabama and the Carolinas, he created a Lillie�s Q sauce unique to each region along the way. The goal was simple: to create a Southern-inspired barbecue experience that�s true to regional traditions and reimagined into unique, authentic and delicious flavors. And he hasn�t slowed down since! After all, the brand is very passionate about its American roots and of our servicemen, as Charlie�s dad Quito was in the Air Force, and currently runs the brand�s Florida restaurant. It was Quito that taught Charlie to grill at a young age. In fact, his very first cooking event was when he was 10-years-old where he assisted Quito with tri-tips on the grill for 750 guests at Malmstrom Air Force Base in Montana. Charlie then began his culinary career at the Culinary Institute of America, trained under Norman Van Aken in Florida, worked at fine dining establishments in Chicago, before going back to his first love of barbecue. He opened the first Lillie�s Q restaurant in 2010, started selling his sauces in 2014, and now the brand is international, with Charlie doing culinary appearances around the world including Meatstock in New Zealand and South Beach Food & Wine Festival in Miami. Lillie�s Q has a sauce to fit every mood, and every dish this side of the Mason Dixon within its lineup of Hot Smoky, Smoky, Carolina, Zero-Sugar Carolina, ENC, Gold, Ivory and the Limited-Edition Bourbon Barrel Aged Smoky, launched every summer. Lillie�s Q sweet brown sugar in its �Smoky and Hot Smoky� sauce represents Memphis; �Ivory� honors the original white sauce of Northern Alabama, the traditional mustard of South Carolina is represented in its famous �Gold� sauce, the vinegar with a kick of spices in the �ENC� is reminiscent of Eastern Carolina, and the tomato vinegar in the aptly named �Carolina� comes from Western Carolina. Labeled #40 on the bottle, the �Carolina� flavor was inspired by Charlie�s regular pilgrimages on Route 40 from the barbeque havens of Memphis eastward to Shelby, Greensboro and Asheville, N.C. Here he learned the nuances of North Carolina�s �sauce divide,� where a slightly sweeter tomato-based vinegar sauce is favored westward of Raleigh-Durham, and thus made its way into his Carolina variety. 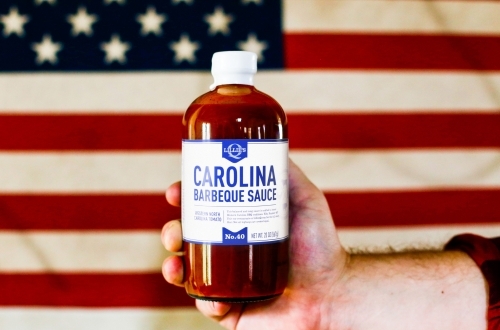 Speaking of the Carolina flavor, Lillie Q�s has now launched its popular Carolina Barbeque Sauce in a zero-sugar variety. Recognizing health concerns and the increased demand for low or no-sugar eating options, Lillie�s Q creator and Chef Charlie McKenna has eliminated sugar from his tangy Western Carolina style sauce, without sacrificing taste. The new Carolina Zero Sugar Barbeque Sauce is sweetened only with sucralose, combined with the iconic flavors of Western Carolina barbeque traditions like apple, lime, and other secret family ingredients. In addition to the sauces, the Lillie Q�s Rub and Kettle chip products are also crafted with authentic southern flavors inspired by Charlie�s travels. It�s these authentic, all-natural southern blends that have acquired Charlie and Lillie�s Q numerous national awards including Winner of the coveted Memphis-In-May World Championship Barbecue Cooking Contest. So whatever mood you�re in, let it take you to Lillie�s Q where you can experience authentically crafted Southern style barbecue mastery. So whether cooking, grilling or smoking, Lillie�s Q brings the best of Southern flavors right to your plate. The Lillie�s Q brand is the fastest growing premium barbeque sauce in America and is rapidly growing its retail presence to stores including national roll outs at Sprouts and Whole Foods, and recent regional additions such as Target, Albertson�s, Safeway, Kroger, Wegman�s and Fresh Thyme. For more information about Lillie�s Q and its line of southern classics, visit www.Lilliesq.com.